Hi everyone! Pardon me for the late introduction. I'm a knitter and a beginner at sewing. This is my first attempt at quilting, so I thought I'd start with something small. It's definitely not a quilt, but it does have a quilted element! 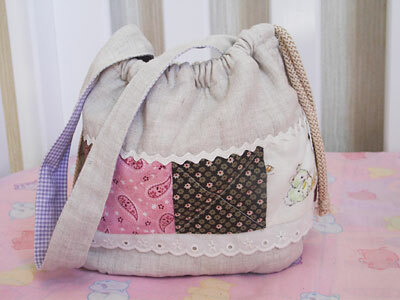 This is a quilted drawstring bag that I made for my daughter. The pattern is based on this tutorial for a drawstring backpack (the "Mama Backpack"), except that I didn't make it into a backpack and added a strap instead, and I added a batting between the outer fabric and the lining and quilted it. I also made the bag smaller, more toddler-sized rather than "Mama-sized".